The shadow box has a picture of Holocaust survivor, David Klebanov. The ribbon and brass button were put together to look like a war medal. The war medal is in the shadow box because he was a soldier at the start of the war. 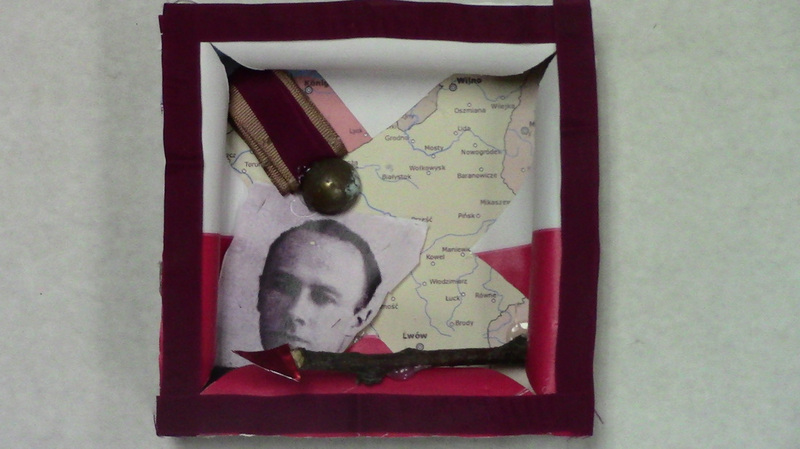 There is also a map of Poland as the background to the box because that is the country he lived in. His home town of Bialystok was marked by cutting a hole where the city used to be. The stick with the red piece of aluminum was created to closely resemble a scalpel, because he was a doctor. On the edges and sloping down to the backdrop is the Polish flag. David Klebanov was a true hero in the Holocaust. He wasn’t any kind of war hero, although he was a part of the Polish Army. He was a hero to the women in the ghetto of Riga. He saved multiple women from being shot and killed by the SS by giving them abortions before the SS could realize that the women were pregnant. He once saved many people in Riga by using the minimal supplies he had to fend off a typhoid epidemic. In 1939, when the war started, David was sent to the front where he was captured within three days of the war beginning. He was sent back as a civilian after a month in captivity to Bialystok, which at the time was occupied by the Soviets. He joined his fiancee in the town of Kovno and got married. The day after they wed, the Nazis marched in and took the town over. He then was deported to the ghetto in Riga. There he attempted to fight off a typhoid epidemic in secret because the SS would kill any sick Jews. He also gave all the pregnant women abortions because all the pregnant women were killed by the SS officers. His commandant liked him because he could do abortions for the women the commandant slept with. He wasn’t sent to any of the camps, probably because he was forced to be a doctor for the SS. David Klebanov was born on November 1st, 1907. He was born in the town of Volkovysk when it was a part of Russia. Because of the Great War he and his family moved three separate times first to Borsov, then to Kiev, and finally to Bialystok, Poland. There they stayed until he finished his schooling and went to Stefan Bathory University in Vilna to study medicine. After medical school he joined the Polish Army and stayed there for one year. After his time in the army, he practiced obstetrics at a beautiful hospital in a small Polish town. Post war, he used his skills to treat death camp survivors. Later in his life, he specialized in treating the effects of hunger. He also specialized in the treatment of emotional stress that women suffered from living through the Holocaust.